Be there to witness the World Champion New England Patriots play at Gillette Stadium. The Patriots are one of the greatest teams in NFL history and now you can travel as part of our New England Patriots Travel Packages which include Patriots game tickets, lodging, and transportation options. Picture yourself watching Tom Brady throw a touchdown in Foxborough. When you plan your Patriots weekend trip with Sports Traveler, it is possible. View our online inventory and purchase securely online. Book your trip today and remember we are your go to source for all Patriots playoff travel packages. Follow the Patriots during the playoffs and beyond! Let us plan your trip to see the New England Patriots, one of the successful teams in NFL history. Foxborough Stadium is on every football fans bucket list to visit and watch at Patriots game. What can be included in your New England Patriots Travel Package? New England Patriots ticket and hotel packages include quality accommodations, great seats to the game, and more! How far from Boston to Gillette Stadium? Located in Foxborough, Massachusetts, Gillette Stadium is the home stadium for the NFL’s New England Patriots. Boston, MA is located about 28 miles or 1 hour from downtown Boston. The stadium was built to replace Foxboro Stadium after the 2001 NFL Season. Due to the distance from Boston, we recommend staying in the Foxboro area during game weekend. The best way to be close to Gillette Stadium is to be part of our Patriots Weekend Packages. 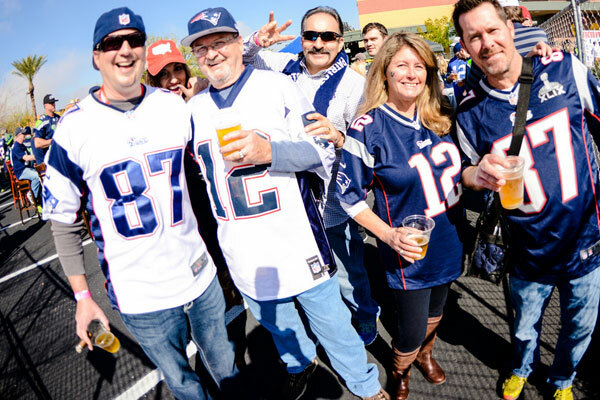 Our travel packages include lodging near to Gillette Stadium, making for an easy game day. Great game tickets to a Patriots game are included in every package, along with transportation to and from the stadium. It is said that there isn't a bad seat in the house at Gillette Stadium. The most affordable tickets are in the upper level, however we recommend sitting in the Lower Level Endzone for great sight-lines of the entire field. Before attending the game, consider heading over to The Hall, adjacent to Gillette Stadium. Here you can visit the official Hall of Fame of the New England Patriots. The museum is the perfect way to learn more about the history of one of the NFL's most successful teams. Where you are a Patriots fan or not, football fans of all ages will enjoy a trip to this interactive Hall of Fame. The weather at a Patriots Game Day can be everything from hot, humid, wet, snowy, windy, or cold. Winter games tend to be the most challenging so plan your trip to a Patriots game appropriately. Sports Traveler recommends aiming for a game in the early fall for the most enjoyable game time weather. Let get started planning your trip to Gilliette Stadium and a Patriots game package weekend! Give us a call today at 1-888-654-7755! Customize your trip to watch the Patriots play!